We started the month of November by moving from Red River Gorge down into North Carolina in preparation for an event we planned to attend outside of Asheville, NC. Grand Trunk Goods, Mountain Khakis, and Brew Dr. Kombucha reached out to us and were interested in doing a giveaway. We hadn’t done one in a long time and decided that the fall colors would make for a fun photo project. We took on the assignment and used it as a way to hunt out some fun spots with beautiful foliage! Here are some of the photos that we got around Pisgah National Forest. After a tough work week complete with awful rain it was time to head just south of Asheville for Overland Expo East. 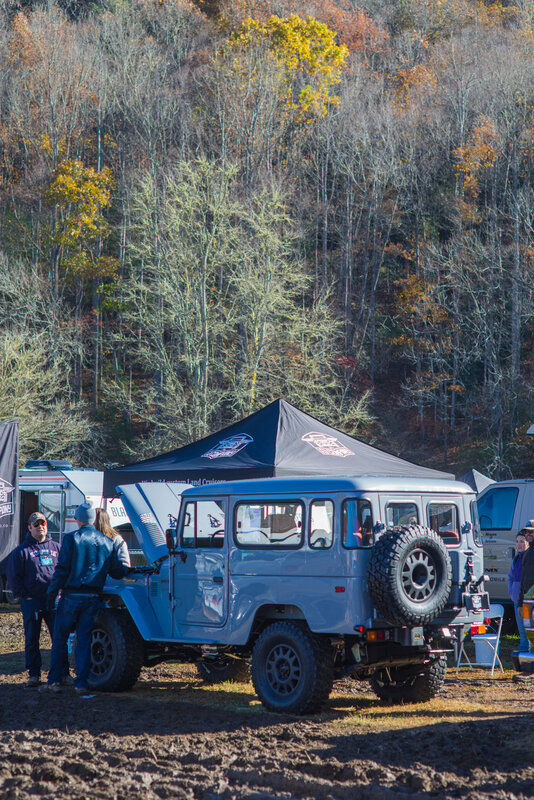 The event was being held at the Oskar Blues REEB Ranch which had also been soaked in the rain leading up to the event. 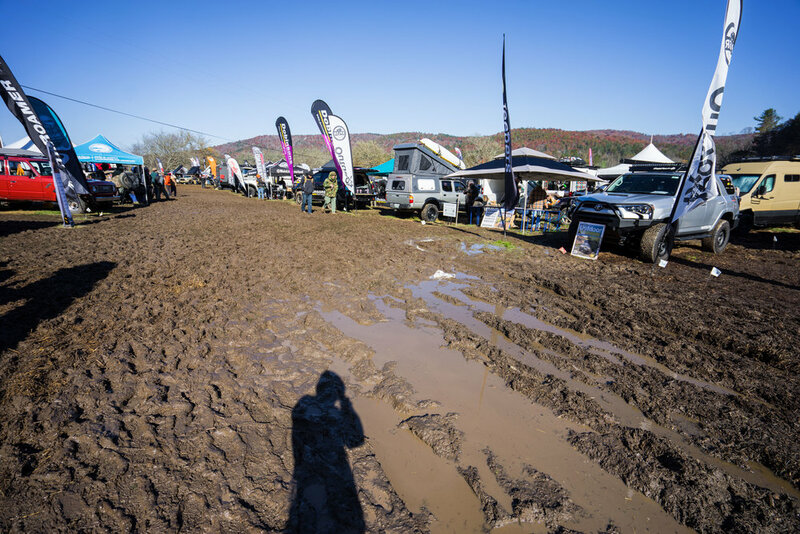 When we arrived, it was an impressive scene of mud and fancy vehicles stuck in the mud! At check in we were nearly turned away because of the chaos that the mud had made for the campers. They said that there was no way our Tacoma was going to be able to make it to our camp spot without getting stuck in the mud. After some negotiation and promises to the event security, they let us in! We made it to our camp spot no problem! We were pretty proud of our little Lando because as we were traversed the mud we went passed a tricked out Jeep as it was getting winched out of the mud! The rest of the weekend the bog that was Overland Expo only got worse. It provided a lot of entertainment watching people and vehicles navigate the treacherous conditions as we sipped our coffee every morning. It was a fun weekend of seeing a full range of impressive vehicles, new and old! It is always such an interesting experience seeing what people come up with for overlanding. We caught up with a lot of old friends, met some new ones, and drank some great beer during our stay. We look forward to attending Overland Expo West this coming spring out in Arizona! After Overland Expo we got a call from our friends over at Bedrock Sandals and they asked if we could go get some product shots in the remaining fall colors in North Carolina! After getting some practice with our giveaway earlier in the month we were excited to head out with our cameras for another project. MAK donning her new Buff from Bedrock Sandals! If you’re not familiar with Bedrock Sandals, they are our favorite footwear on the face of this planet! They’re perfect for all of our outdoor activities from long distance hiking to hanging around camp! We’ve been fans for the last few years and are always excited to have an excuse to put them into action. We decided that Max Patch would be a great place for us to capture the sandals in action. We first came to Max Patch this past summer on our way north to Canada and fell in love with the 360 degree views. The last time we visited we came through for sunrise but this time we thought it would be fun to see it at sunset! Once again, Max Patch didn’t disappoint! We had a blast hiking to the top and making the most of the golden hour! Here are the results of our assignment! While we were traveling though Canada we started to dream up some new products to sell in our web-store! We waited until we returned to the USA to get them live on the site but are excited to introduce our new goodies! We added two new stickers, a tote bag, a new key tag, and two patches! All of the proceeds of our web sales go toward keeping gas in our tank as we continue our travels! If you’re interested in supporting our journey feel free to head over to our online shop to check out all of our goodies: BFN Web Store As always we appreciate all of your support, it means the world to us! After leaving North Carolina we headed down into Georgia for some time with family for the Thanksgiving holiday. It was nice to have our first taste of home in a few months and to be traveling through our old stomping grounds! After Thanksgiving, we started to make our way towards Florida in preparation for the Christmas holiday! We looked into different paths of travel for our journey south, but the cold and rain drove us towards the coast. It was a great opportunity to see Charleston and all of the cool towns that line the southeastern coastline. When we got into the Charleston area we worked just outside of town before heading into the downtown area to enjoy the afternoon. Sadly we only had one day in Charleston and wanted to see as much as possible, so we took off on foot through the historic downtown area. Charleston is the kinda city we could see ourselves in one day. Amazing history, architecture, food, and water near by! You would’ve thought I had won the lottery because I walked around all afternoon with the biggest grin on my face! It was a great way to kick off our coastal tour south! That’s it for November! Next time, we continue south!